Peel and chop the potatoes into bite-size pieces. Chop the onion, carrots (if using large whole carrots), and the celery. 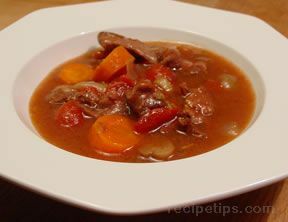 Place the stew meat and the vegetables into the slow cooker. Stir the gravy and seasoning mixes into 2 cups of water; then pour it over the ingredients in the slow cooker. Add more plain water to the slow cooker until the ingredients are covered. Cook covered on the high heat setting for 4 to 6 hours or on the low heat setting for 8 to 12 hours. 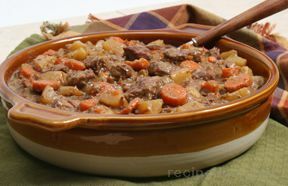 Note: If the stew's gravy is too thin, pour some of it into a saucepan and thicken in the same manner as you would any other gravy, such as using a mixture of flour and water and adding it to the gravy; and then bringing the gravy to a boil. Add thickener and boil until the gravy is the desired thickness and then pour it back into the rest of the stew. 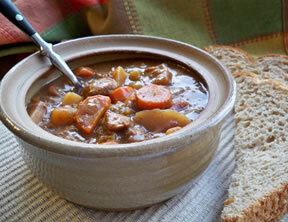 "I threw this beef stew together the night before and plugged it in just before I went to work. It smelled so good when I came home. I did have to thicken the gravy a little, otherwise it was very good. It made a nice size batch so we will have leftovers to enjoy too."